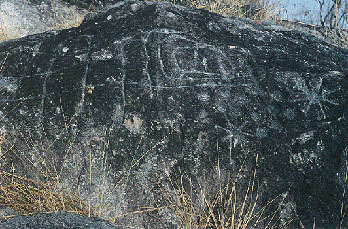 Click on the region of the map to view the growing collection of petroglyph images. 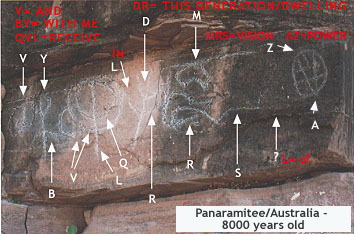 You are now in what was formally a private archive devoted to an amazing discovery concerning the similarities of ancient petroglyphs (carved stone images) from many different and distant parts of the planet. Thanks to the internet, we have been able to assemble this growing collection from amateurs and professional archaeologists and to make side-by-side comparisons. We invite you, readers of Viewzone, to inspect these images, contribute your own finds, and help us to understand who made these, what they mean, and what implications does this global communication and culture have to our understanding of human history. Links and documents are listed by geography. 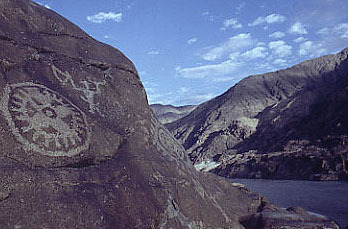 Click on the map for examples of the petroglyph styles around the globe. OKLAHOMA! - New translations from old photographs in the panhandle area of Oklahoma. TRANSLATED ARTIFACTS FROM YEMEN -- Links to our growing collection of Sabaean writing and translations using First Tongue. Critique of W.F. Jamme's attempted Sabaean translations. 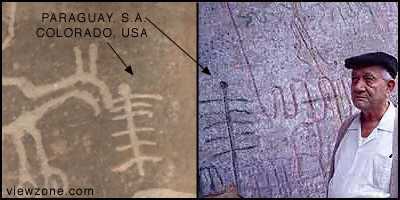 The 2 photos show the similarity of images and symbols used to communicate in antiquity.